Habitat : Common in central and southern india extending to srilanka. Uses : Phyllanthus blocks DNA polymerase, the enzyme needed for the hepatitis B virus to reproduce. It also prevent from jaundice,diabetes, dyspepsia, ulcers, sores, swellings, ophthalmia and chronic dysentery. Whole plant is useful for the treatment of some forms of gonorrhea, menorrhagia, dropsy, menorrhagia and other genito- urinary affections of a similar type. A poultice of the leaves mixed with salt cures itch and other skin affections. It is bitter, astringent, cold, anti-inflammatory, hepatoprotective and useful in liver disorders, cough, asthma, jaundice, spleen disorders. 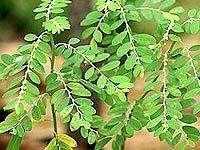 Phyllanthus may help decrease the amount of hepatitis B virus found in the blood stream.